Stay up-to-date via our Facebook group here! Interested in being part of the showcase? Come to a meeting and find out more! LIVE on the air, web stream, & studio audience! 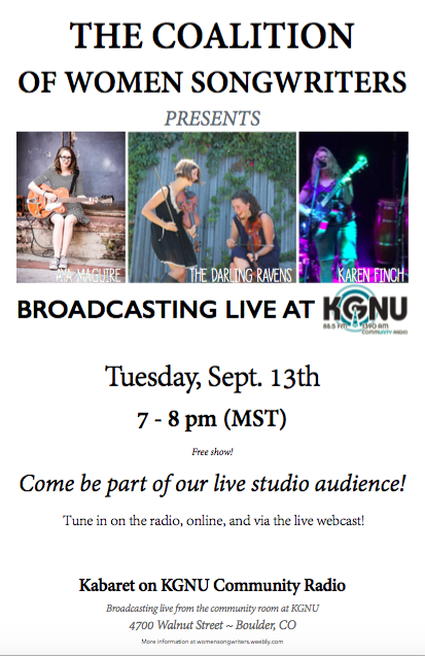 Be part of our live studio audience at KGNU or tune in from afar! 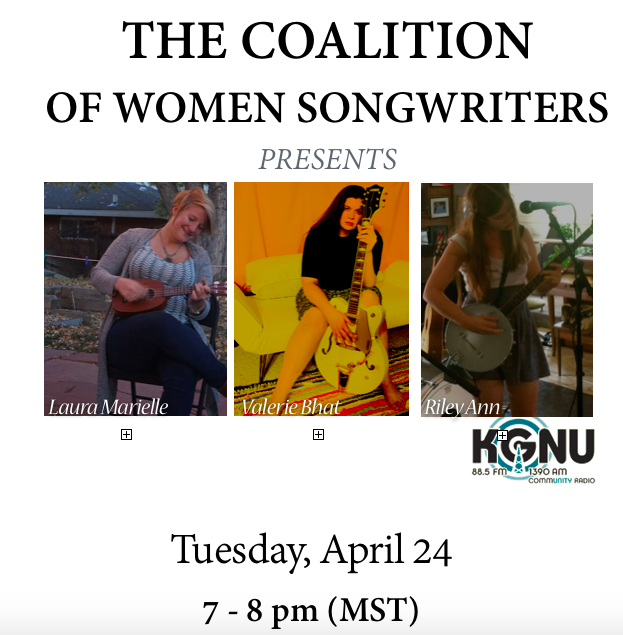 We'll be doing a live broadcast for the Kabaret showcase for the Coalition of Women Songwriters! Questions? Interest in joining the organization? 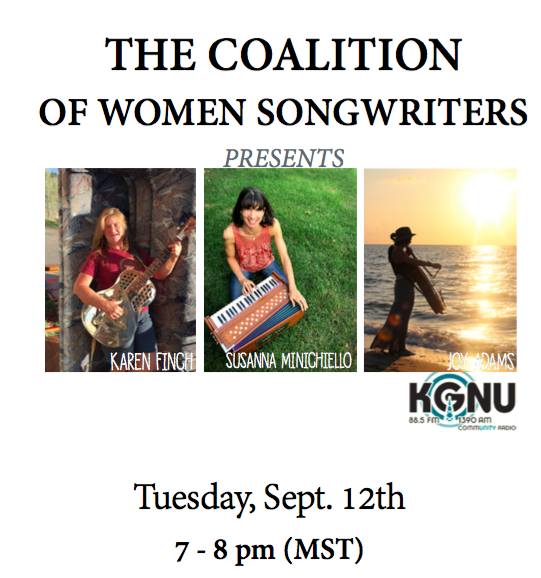 Contact Riley Ann for more info on the event and the Coalition of Women Songwriters here! Meetings are generally held on the fourth Wednesday of each month at KGNU Community Radio in Boulder. All Boulder-area womxn musicians are encouraged to join our Facebook group for updates. Contact Riley to find out more! All womxn musicians are welcome in this safe space! This is an LGBTQIA-friendly environment. There are no membership fees; all you have to do is show up! ~ Any handouts (e.g. business cards, posters for upcoming shows, email list for specific volunteer opportunity, etc.) that you'd like to display on the literature table or hand out. ~ Workshoppers: bring copies of lyrics & chords of tune you're having workshopped (approximate number of copies per Facebook RSVPs). You're welcome to bring snacks to share! Let's get together! All womxn songwriters are welcome in this inclusive safe space. Come and go as your schedule permits - our door is open! We meet in the community room at KGNU. Please bring: A writing utensil to give feedback to workshoppers & any instrument you'd like to play at the jam, whether it's your voice, your ukelele, your tambourine, or that flute you haven't played since high school. Anything goes! The room is available for jamming, planning, cowriting, breakout sessions, etc. Feel free to continue conversations from the meet & greet! KGNU is not only our "home" for meetings, but it's also where we have regularly scheduled showcases of our members. We curate our showcases on KGNU's Tuesday night Kabaret show every few months. Stay tuned for more information on our next showcase! More info about Kabaret here. Past Kabaret shows archived here. Typical structure: 3 members of the Coalition of Women Songwriters perform in-the-round style, sharing their music and stories behind them. You can be part of our live studio audience at KGNU or tune in from afar! Tune into our live broadcast on the web or radio, or join us in the studio.